The good news is it can be easier than you think to do some of the basics yourself. Most drivers check oil, water and tyres regularly knowing that monitoring these can increase a car’s efficiency, as does the quality of the oil and filter. It’s no good trying to save a bit of money attempting to service your car at home if you have no clue about what goes on under the bonnet. You’ll end up paying a mechanic more to fix the things you’ve broken in your enthusiasm to get ‘hands on’. If you’ve ever successfully managed a DIY oil and filter change, then you may have the potential to advance to more complicated tasks with the help of a Haynes manual, but don’t be fooled into thinking that you can completely service your Audi A4 on the driveway to the same standards as a garage. Vehicles are now designed to inhibit enthusiastic DIYers. You can assume that sensors, wiring looms, ABS systems and even air conditioning might need a pro to look at them, but some of the simplest jobs can be ridiculously difficult. For example, previous models of the Renault Megane are designed in such a way that the front bulbs need a trip to a professional for replacement. Theoretically, you can access the headlamps from under the wheel arch, but the reality is that some mechanics have had to remove the bumper which can be quite costly when you consider the average halogen bulb has a lifetime of only 300 to 400 hours. When you have your car serviced at a garage, you generally get what you pay for. French manufacturers are notoriously awkward to change some components due to the ‘compact’ engine bay and it’s not unusual to pay a fiver for a bulb plus another £50 for half an hour of a mechanic’s time to fit it, having dismantled and reassembled a large section of your car in the process. 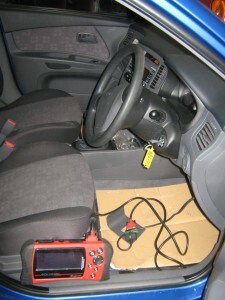 You could save more money in the long term when the day comes to sell or part exchange your car at www.motormart.co.uk. New cars for sale from a dealership will always sell for a premium, but if you look after your vehicle and service it regularly, it will be in far better condition and fetch a better price than those that have no history of maintenance at all when the time comes to sell. « Skoda Fabia vRS the competition!